A top down approach within the Metis Nation of Alberta is not sitting well with five of the 11 locals that comprise Region 1. The see recent moves by the provincial head office as a cash grab. 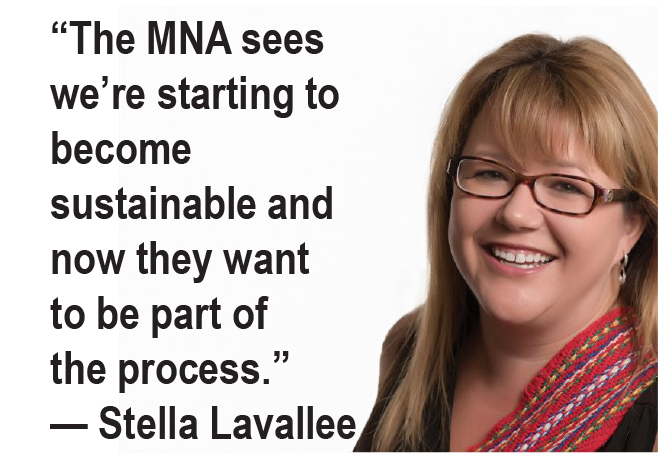 Now that the province is working on an official process for engagement between industry and Metis communities, which involves financial benefits, the MNA provincial office wants to get involved, said Stella Lavallee, president of the Willow Lake (Anzac) Metis local. “Now the MNA sees we’re starting to become sustainable and now they want to be part of the process,” she said. A large portion of Region 1 is in the thick of the oilsands. Region 1 also has the highest Metis population in the province. Until now, says Lavallee, locals have engaged with industry on their own. “Willow Lake for the past 20 years has asked Region 1 and the MNA to help them with this consultation process, because it’s new and we don’t have the resources like First Nations do. And we were pushed back and (they) said we have to do it on our own because they didn’t have resources to provide for us. But now that the consultations are happening, they want to come in,” said Lavallee. MNA head office does not have the knowledge necessary to represent the communities that are directly impacted by development, Lavallee says. After years of working with industry, Willow Lake has its own processes in place, as do Lakeland, Owl River, Conklin, and Athabasca Landing locals, which Lavallee also speaks for. Some of the other locals in the region feel the same, she adds, but don’t want to take an official stand. That overstepping is continuing with a meeting scheduled for April 10 in Lac La Biche, where the Region 1 head office is located. The community meeting is to look at finances, said Lavallee, but Cardinal has directed that accountants and lawyers not be present. Lavallee adds that no financial records have been requested from the past four years nor has she received an agenda for the meeting so she is unclear as to the meeting’s purpose. Poitras will be presenting the financials at the meeting. Lavallee will not be in attendance due to personal commitments. Local members are encouraged to attend, but Lac La Biche is a three-hour drive one-way from Anzac. This is not the first time a meeting has come under question since Cardinal was elected Region 1 president last September. Lavallee said the first regional meeting in November, attended by Poitras, was a fiasco with decisions made without quorum. “Since President Cardinal was elected in September, I believe, the MNA has been directing President Cardinal with the attempt to conquer and divide Region 1 as well as dividing local communities,” she said. As unhappy as Willow Lake Metis local is with what’s transpiring with the MNA, Lavallee says Willow Lake is not ready to follow in the footprints of the Fort McKay Metis local. Fort McKay Metis members recently shifted their membership from the Metis local to the Metis community association. While the local is legally in a state of limbo, the association is undertaking all government and industry consultation for the McKay Metis. “Fort McKay does have the capacity to do that for its members at this point. I truly applaud them for that,” said Lavallee. What she wants to see happen right now is for Poitras and Cardinal to follow the bylaws and be held accountable if they continue not to. Lavallee says she recently sent a letter to Poitras outlining her concerns. She has not yet received a reply. James Cardinal did not respond to requests from Windspeaker.com for an interview.